I would recommend driving it from south to north, or if you prefer, bottom to top. While driving it from the other direction does have its appeal, there is something magical that happens when driving from bottom to top. Here’s the deal. 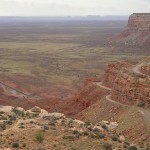 As you drive through the valley below the overlook you will note the large cliff ahead of you. If you are paying attention, you will see that there doesn’t seem to be a way over or around it. The road simply appears to end. However, as you get closer you start to see glimpses of asphalt and gravel higher up the cliff. As you head up, each tight switchback reveals washboards, ruts, washed out stretches, steep drop offs, loose gravel, and narrow lanes. 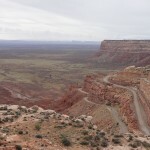 The Dugway has had a rough life. 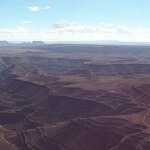 As you climb nearer to the top you’ll also see an ever widening view of red rock spires, mesas, Comb Ridge, and desert. For the best payoff, take the rough road to the left at the top. 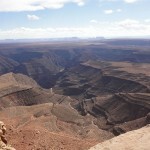 At the end you will find yourself at Muley Point, one of the most beautiful places on earth.